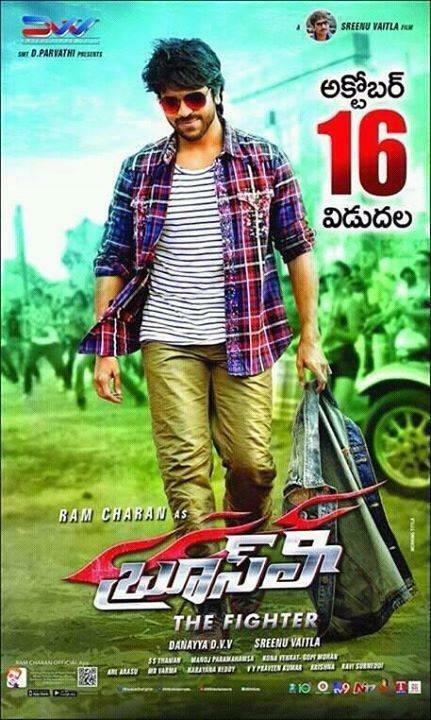 RamCharan’s Movie “BRUCELEE THE FIGHTER” directed by sreenuvaitla is gearing up for grand release on October 16th. RamCharan started promotions for this movie. Brucelee will release in telugu as well as in tamil. Here it is Ramcharan shared his views about this movie and his upcoming projects. Tell us about Bruce Lee? I had been looking for a light hearted entertainer for a long time. Seenu Vaitla came up with this storyline which has entertainment and a strong family emotion. You generally expect entertainment in Seenu Vaitla’s films. Bruce Lee has story orientation, engaging screenplay and entertainment. It has a strong brother – sister sentiment. And a son – father bonding too. I play the role of Karthi – a boy next door who works as a stuntman in films. Rakul Preet Singh plays the role of Riya. It’s mainly a family emotion-driven film and love story is not that important. The comedy (Brahmanandam, Ali etc) in this film is blended into story and not treated as a separate track. Sreenu Vaitla is a jovial guy to work with. Writers and the director complemented each other and it’s perfect teamwork. Thaman has composed nice tunes and everybody is liking the music. Your last film GAV and this movie Bruce Lee have strong family stories? Yes. It’s not intentional. I don’t have a family in my next movie (Telugu remake of Thani Oruvan). Since the story touches Telugu film industry, are there any satires on actors/films in Bruce Lee? I am personally against any satires on industry or industry people as it means we are belittling ourselves. There will not be any satires on films or actors in Bruce Lee. How did you arrive at your look? I wanted to cut the hair short. It was Sreenu Vaitla who suggested that I should have hair style similar to that of Chirutha movie. I styled myself for this movie and I didn’t have any stylist. When we shot songs in abroad, I went four days ahead of the shoot and did shopping for my costumes. I have also styled Chiranjeevi for his cameo in Bruce Lee.Fight master Kicha has a training school in Bangkok and I went to there for body conditioning as I play the role of a stuntman in Bruce Lee. How did Chiranjeevi do in Bruce Lee? We had to cast a popular actor to do a role of himself for a scene towards climax. It was supposed to be done by another actor, but things didn’t work out. When Sreenu Vaitla suggested Chiranjeevi’s name, I objected to it as I am to produce his 150th film. But Sreenu Vaitla approached Chiranjeevi directly and made him accept. Chiranjeevi then convinced me that he should do this cameo. Initially he has planned a fight followed by a song. I had to say yes to fight, but said no to song. Chiranjeevi plays himself in this movie. He sports a light beard like he did in Gang Leader. He looks electrifying on screen and he is very charming. He looks slimmer than his Shankar Dada days. You seem to have worked tirelessly to meet release deadlines? A couple of months back, I have asked Sreenu Vaitla if we can complete the film so quickly without losing quality and he said yes. I made sure that I contributed to it from my side. I have worked like a robot in the last few days. Bruce Lee title song which is generally shot for 5 days is completed in just 2 days, that’s too without compromising in quality. I give a lot of credit to the cinematographer Manoj Paramahamsa in this aspect. Bruce Lee is getting a massive release in USA in 200 plus locations. How do you feel about it? US distributor Sudhakar is very enthusiastic about it. Lets hope for the best. I will go to USA for 2nd weekend of Bruce Lee to meet movie lovers if things go well. After stupendous hits like Baahubali and Srimanthudu, there is bound to be a lot of pressure on your fans regarding box office performance of Bruce Lee. How do you react to it? Fans should not undergo through any pressure. They should handle everything in a positive way and let the things unfold naturally. We have three big releases in three consecutive Fridays which is not good for industry? There has always been a unofficial pact between all of us to maintain a 2 week gap between big films. Aagadu team requested us for a 2 week gap and we made sure that Govindudu Andari Vaadele was released 2 weeks after Aagadu. Despite being a huge filmmaker, Rajamouli didn’t go for ego and requested Srimanthudu team to postpone it. Despite being big star Mahesh Babu has requested NTR arts to have a gap of 2 weeks between Srimanthudu and Kick 2. Our team has announced this release way back in February. We stuck to our date. The other two films which were supposed to release earlier came for October release. Bruce Lee team didn’t break the rules. I had also talked to Bunny regarding the same. We have to stick to a 2-week-gap commitment for all biggies in the future. I hope that nobody gets affected due to 3 big releases in this month. It has become a trend to adopt villages after the release of Srimanthudu. Are you going to adopt any village? My dad has adopted a village called Perupalem near Narsapur in 2014. I will contribute to it. I will adopt villages when I make enough money. I am going to have a break for 2 months as Thani Oruvan remake script will be ready by December. Gowtam Menen has also narrated me a love story with action orientation. I will do his film in next year. I have recently met Pawan Kalyan when he was shooting for the item song of Sardar Gabbar Singh. My film in his production will also start in the next year. I am going to start two production houses. One is Konidela productions that produces big films starting with Chiranjeevi’s 150th film. The second one is White Horse productions which will produce small budgeted movies (2 cr to 5 cr) with new writers and new directors. I will announce the contact for White Horse productions soon so that new writers/directors can approach. I will release the logo of Konidela productions on 16 October. Chiranjeevi’s 150th film will go to floors after Sankranthi 2016. Here it is interview.watch it….